. : LuCaspeRobin + Thomas ;-) :|: Webdesigns' section :. - Spam - what is that? Spam - what is that? 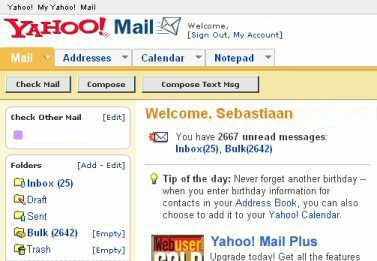 A couple of months back Yahoo Mail went into Beta. It now resembles the interface of Gmail, only more clogged up and less transparent. Gmail rules when it comes to simplicity and user friendliness, but Yahoo Mail Beta has taken the whole AJAX experience one step further. You can really experience the AJAX - just look at the waiting, loading and "just a moment, I'm getting there"-messages (joking)! I think the interface is a lot nicer, not to say a lot more standardized than the GMAIL code (check out Roger Johansson's story on "Making Google Standards Compliant"), and the Beta version works a lot more like a normal mailclient. What hasn't changed is the ability of spammers to fill up my Yahoo mailbox with spam, junkmail, garbage and other useless stuff I'll never read, buy, use or do anything with. Nevertheless, as the screenshot shows, my mailbox keeps filling up with spam, which is clogging up the arteries of the Internet. More than 84% of all e-mails sent last year werebelieved to be spam. If this trend continues an estimated 90% of all e-mails sent next year will be spam. Isn't it time we asked our governments and ISP's to REALLY do something about this? And today I had 2032 spam-messages, all eminating from around ten sources. But what was really interesting was that most of the mails where modified at around 1/1/38 or 31/12/37. That's more than 30 years in the future. Help! I don't wanna know about all the future mail I'm gonna receive - I can't even handle all the spam I get today! Post a comment on "Spam - what is that?"